after couturiers. From her Wimbledon studio she works closely with her clients to create stunning pieces of bespoke couture and bridal wear. Coming from a family of entrepreneurs, Nuutinen’s childhood interest in couture started by making soft toys and teddy bears, before moving onto clothes for family and friends. She later trained for four years and gained experience in many aspects of the clothing industry, before moving to London ten years ago. She now runs her business combining motherhood (her 18 month old accompanies her to the studio/boutique daily) and couture design. possible and currently recycle approximately 75%. Gorgeous designs. Especially love the details of the last piece! Besides for the exquisite designs, I love how they styled the model it blends perfectly with the classic beauty of the dresses. Gorgeous dresses! the design is truly amazing! Wow, WOW! I've fallen in love with the last dress, it's absolutely amazing. I like blogs full of good ideas and fresh as yours. the draping of the dresses are just amazing, and i rally like the soft material mixed with pleats. 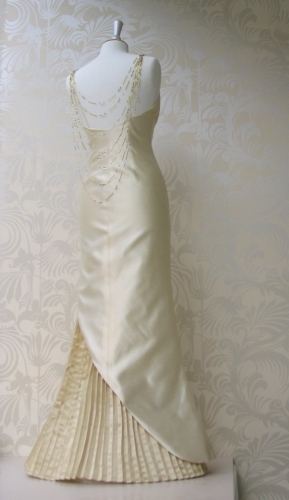 Gorgeous wedding dresses!The last one is fantastic!The back design is my fave! A little low self-esteem is actually quite good. Maybe you're not the best, so you should work a little harder. ABOVE THE CURVE . . . .